Karrouf, G., et al. Potential Effect of Meloxicam and Tramadol on Neuropathic Wound Healing in Rats. (2016) J Vet Sci Animal Welf 1(1): 1- 5. © 2016 Karrouf, G. This is an Open access article distributed under the terms of Creative Commons Attribution 4.0 International License. Introduction: Pain management in animals can be increased by inappropriate housing, handling, and restraint and by utilizing unsuitable experimental techniques especially when surgery including in the protocol. Proper surgical techniques can decreased complications which contribute to postoperative comfort. Objective: The study assessed the potential effect of meloxicam and tramadol or their combination as multi analgesic model on neuropathic wound healing in rats. Methods: Rats had randomly assigned into 4 groups (10 rats for each treatment). G1 that didn’t receive any treatment, G2 receive postoperative tramadol hydrochloride (15 mg/kg; Tramal 5%, Minpharm, Gru¨nenthal, Germany; T15), G3 received meloxicam, (6 mg/kg; Anti-CoxII0.5 %, Adwia, Cairo, Egypt; M6) and G4 receive both T15 and M6 that include post-operative T15, M6, T15 + M6 from the 5th till 11th days post-operative. Results: Granulation tissue was less neovascularization of the analgesic treatments was seen on day 10 postoperatively than in Control group. At day 14 postoperative the rats treated with M 6 mg/kg and T 15 mg/kg + M 6 mg/kg had increased of mononuclear cells in comparison to the others. 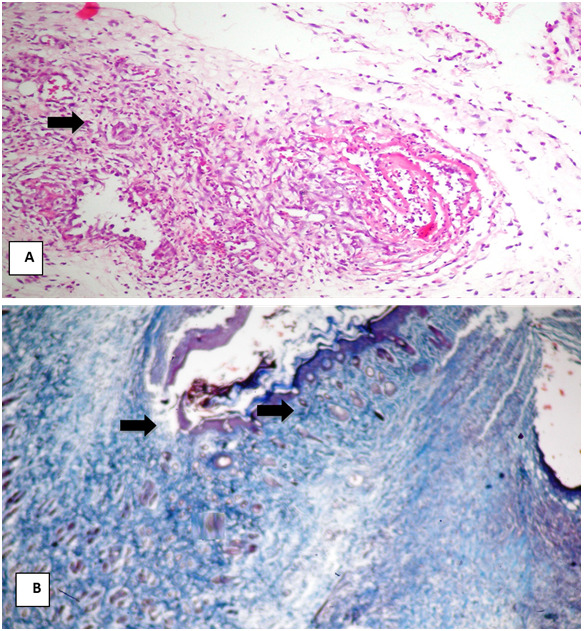 Granulation tissue showed less proliferation of fibroblast and collagen in the analgesic treatments. Epithelial regeneration and collagen deposition were more prominent in the T 15 mg/kg compared to other treatments. There was decreased in granulation tissue inflammatory exudates in all treated animals. Conclusion: The present study indicated that meloxicam and their combination leads to a slight delaying in the process of wound healing. Healing of wound involves a series of overlapping phases, including homeostasis, inflammation, proliferation, and remodeling. The inflammation is accompanied by edema, pain, redness and leukocytic infiltration as neutrophils, macrophages and fibroblasts that were considered as minor sources of the cytokine[1,2]. The healing process in full-thickness wounds includes coagulation, inflammation, formation of tissue, and remodeling. The inflammatory phase extends from 1 - 5 days after injury by migration and accumulation of cells in the wound with predominating of neutrophils in the early hours of inflammation. Finally, the re-epithelialization start at the edges of the wound as early as 24 hours post injury, while wound granulation begins 5 days after injury to re-establish the epidermis and dermis integrity at the wound site. Stress and pain may slow healing of wound, the psychological stress or triggers the hypothalamic-pituitary-adrenal axis promoting the production of vasopressin and glucocorticoid (cortisol). This process leads to a depression in immune function and changes in the levels of various inflammatory cytokines and enzymes involved in tissue repair[5,6]. NSAIDs decrease the initial response to inflammation, which may interfere with healing of wound. Reaction of COX-2 products are responsible for many inflammation cytotoxic effects and their role in increasing inflammation in the skin, PGE2 and other prostaglandins had shown to enhanced proliferation of fibroblast and production of collagen[7,8]. Healing of wound delayed after treatments by NSAIDs by interfering with different phases of the processes by a slight decrease in inflammatory and mast cells infiltration in the wounds on day seven post wounding. In addition, it caused a slight deficiency in the process of healing by decreasing contraction of wounds, and angiogenesis, which are two crucial factors in tissue integrity. So it should be used judiciously to minimize their adverse effects on wound healing. Forty apparently healthy male Wistar rats (aged 6 months weighted 250 – 300 grams were used for this study. Rats were housed under standard laboratory conditions (temperature 23 ± 2°C, with a 12h / 12h light/dark cycle). They had free access to standard laboratory feed and water up to the time of the experiment. All experiments were conducted in accordance with the Guidelines on Ethical Standards for Investigation of Experimental Pain in Animals. In addition, the protocol was approved by the Mansoura Medical Research Ethics Committee. The surgical procedure was performed under the effect of medetomidine 0.4 mg/kg (medetomidine hydrochloride (0.4 mg / kg; Domitor 0.1%, Pfizer, Seixal, Portugal) and ketamine 60 mg/kg I/P (Ketamax 5%, Troikaa, Gujarat, India). Under aseptic technique, the sciatic nerve in one of the hind paw was exposed and tie ligated with chromic gut ligature (5 - 0) (Sharpoint®, USA) that were placed around the nerve proximal to the trifurcation. The muscles overlying the nerve were sutured with chromic gut ligature (3 - 0) (Sharpoint®, USA). The wound was irrigated with normal saline and closed with surgical skin staples (WacosTM, SUNMEDIX, China). Rats had randomly assigned into 4 groups (10 rats for each treatment). G1 didn’t receive any treatment, G2 receive postoperative Tramadol hydrochloride (15 mg/kg; Tramal 5%, Minpharm, Gru¨nenthal, Germany; T15), G3 received meloxicam, (6 mg/kg; Anti-CoxII0.5%, Adwia, Cairo, Egypt; M6) and G4 receive both T15 and M6 that include post-operative T15, M6, T15 + M6 from the 5th till 11th days post-operative. I-Macroscopical findings: Clinical evaluation of treated surgical wounds on the 5, 10 and 14 days post-operation to detect hyperemic areas, edema, crust, debris and closure of the wound in comparison with No treatment control group. II- Histological examination: Skin specimens from wounds of each group were collected at 5 and at 10 days postoperatively. All collected specimens were fixed in 10% neutral buffered formalin solution for 48 hours, trimmed to suitable sizes, washed, dehydrated, cleared in xylol, embedded in paraffin wax, sectioned at 5 - 6 μ thickness, and mounted onto glass slides stained with Hematoxylin and Eosin (H & E), Masson’s trichrome stains for evaluation using conventional light microscope (Olympus BX 51) at 40x and 400x magnification) and examined microscopically. On 5th day postoperative; CCI rats appeared rough coat, arched back and porphyria (read tears around nose and eye of rats). Where wound edges were closed to each others with painful and edematous edges. At 10th day post surgery; in rats that treated with T 15 mg/kg, and control one showed a complete wound closure. But in M 6 mg/kg or T 15 mg/kg + M 6 mg/kg treatments still inflamed and painful wound edges with minimal scar. At 14th day; wound healing occurred in M 6 mg/kg or T 15 mg/kg + M 6 mg/kg treatments. On day 5 post-wounding, in all treatments; blood clot and the inflammatory cells (mainly neutrophils, macrophages and lymphocytes) infiltrated wound gap (Figure 1). On day 10 post-wounding, control group showed that in this inflammatory stage, the tissue of injured skin was edematous and characterized by multiple empty spaces. The effusion was formed a thick fibrin layer, and inflammatory cells advance along lines of fibrin within a clot and along capillaries that are growing into the wound. 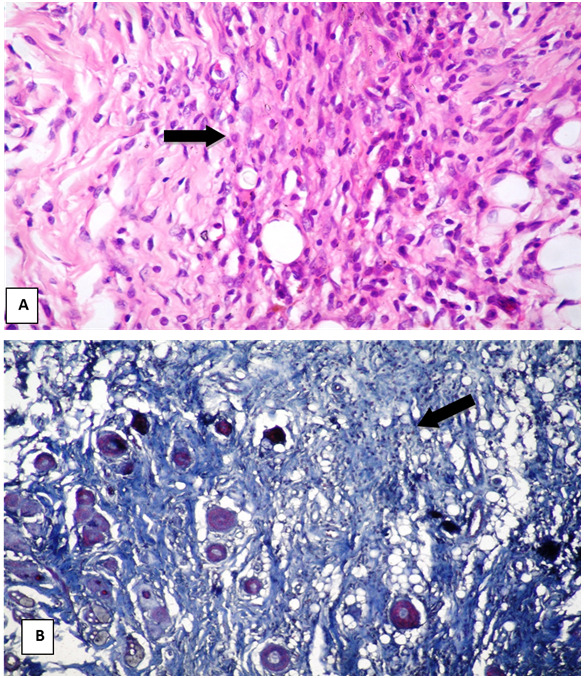 The granulation tissue was rich with mixed inflammatory cells and neo-vascularization (Figure 2A). Around the neo-vascularized area, fibroplasia and collagen synthesis was found. 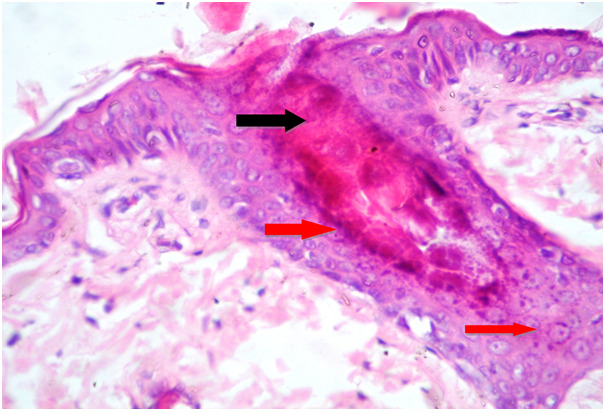 Epithelialization was also started at the edge of the wound (Figure 2B). Figure 1: At 5th day post surgery in CCI rats. (A) Blood clot obliterating wound gap (black arrow). (B) Inflammatory cell mainly neutrophil and macrophage infiltration into the wound (red arrow) (H & E, 120x). Figure 2: At 10th day post surgery in Contolo group No treatment of rats. 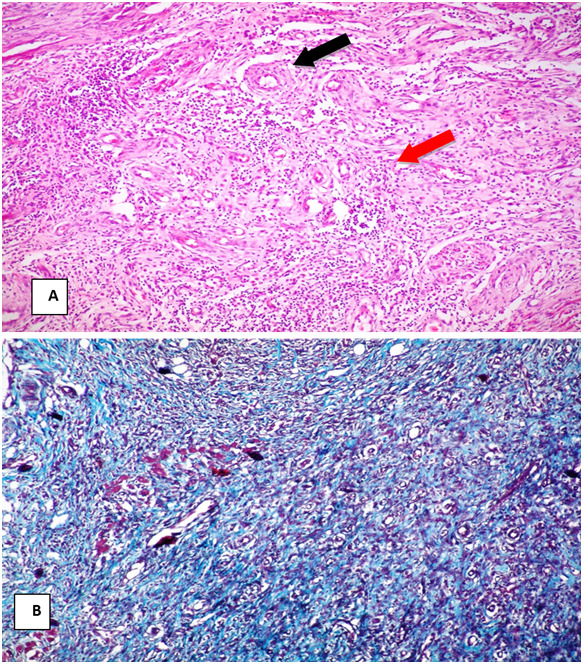 (A) Granulation tissue proliferation obliterating wound gap (black arrow), with moderate inflammatory exudate (red arrow) (H & E, 120x). (B) Haphazard arrangement of less collagen fiber that stained blue (arrow) (Masson’s trichrome, 120x). Neovascularization was less in the granulation tissue of the analgesic treatments on day 10 postoperatively, than in Control one. M 6 mg/kg and M 6 mg/kg + T 15 mg/kg treated animals demonstrated a relative paucity of healing tissue on 10th day. Although there were some new blood vessels present and a small number of inflammatory cells, there was minimal collagen and epithelial regeneration. Also the inflammatory exudate was more pronounced (Figure 3). Figure 3: At 10th day post surgery in rats treated with meloxicam 6 mg/kg or their combination with tramadol 15 mg/kg. (B) Marked granulation tissue proliferation with less organized collagen fiber (arrow) (Masson’strichrome, 120x). T 15 mg/kg treated animals showed an increase of epithelial regeneration, fibroblast proliferation and collagen production compared to other treatment. Furthermore, infiltrations of inflammatory cells were less than control one (Figure 4). (A) Granulation tissue proliferation represented by ill developed blood capillary (black arrow) and young fibroblast (red arrow)(H & E 120x). (B) Granulation tissue proliferation represented by little collagen fibres stained blue (Masson’strichrome, 120x). Control group: Wound closure was observed after epithelium regenerated on the surface of the healing tissue. There was no inflammatory exudate in the granulation tissue except for one specimen. 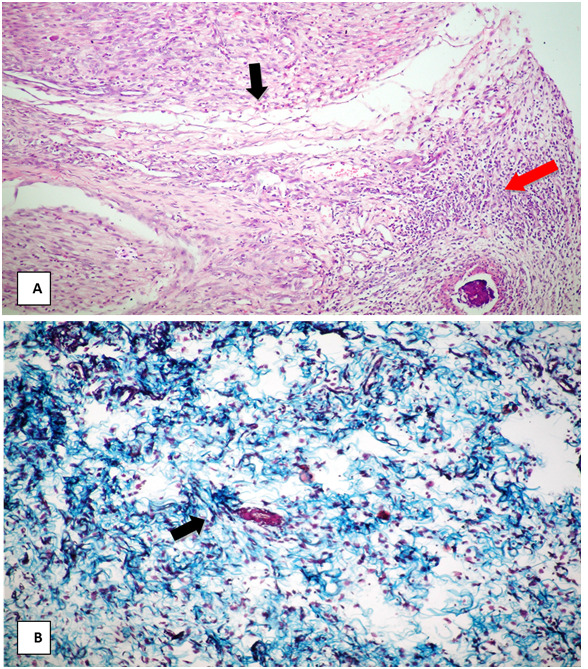 Neovascularization and infiltration of inflammatory cells became milder (Figure 5A). Fibroplasias and collagen deposition was more remarkable than that of day 10 postoperative. Collagen densities had increased, but still different from dermal collagen bundles in unwounded dermis (Figure 5B). Figure 5: At 14th day post surgery in control group no treatment rats. (A) Fibrocollagenous tissue forming suture line with minimal loss of skin (arrow). (H & E, 120x). Analgesic treatments: In rats treated with M 6 mg/kg and T 15 mg/kg + M 6 mg/kg had higher levels of mononuclear cells compared to the others. Fibroblast proliferation and collagen content were less in the granulation tissue of the analgesic treatments on day 14 postoperative, than others (Figure 6). Histologicalfindings showed that epithelial regeneration and collagen deposition were more prominent in the T 15 mg/kg compared to other treatments on day 14 postoperative. There was minimal inflammatory exudates in the granulation tissue of all treated animals (Figure 7). Figure 6: At 14th day post surgery in rats treated with meloxicam 6 mg/kg and their combination with tramadol 15 mg/kg. (A) Mature fibrous tissue proliferation filling wound gap (arrow) (H & E 120x). (B) Mature fibrous tissue proliferation with less deposition of fibrillar collagen (arrow) (Masson’strichrome, 120x). Figure 7: At 14th day post surgery in rats treated with tramadol 15 mg/kg. 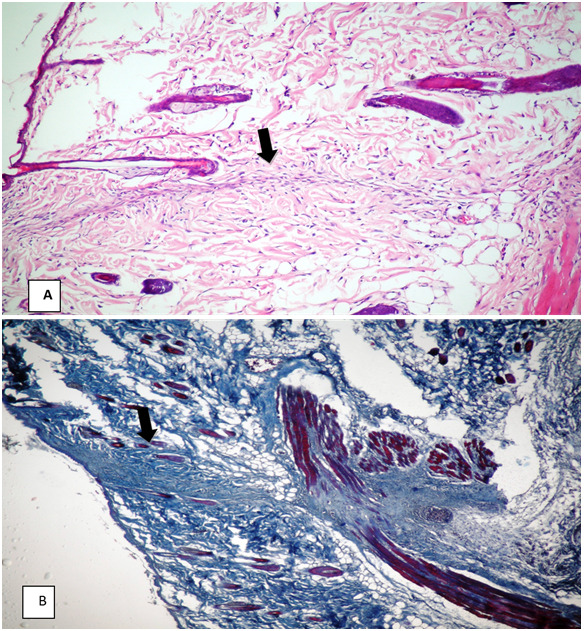 (B) Bluish stained collagen fiber indicating mature fibrous tissue proliferation in wound gap (arrow) (Masson’strichrome, 120x). In Control and tramadol group rats, show edema, redness, inflammatory exudate and microscopically findings of with an adequate infiltration of neutrophils, other inflammatory cells and fibroblast cells that help wound healing as clarified by[2,12]. Also it could be explained by the lower anti-inflammatory effect of this agent. These groups (control, tramadol) had no effect on PGE-2 production as pro-inflammatory cytokines that is a sensitive early marker of tissue damage and a major role in wound healing series as described. Unlike opioids, meloxicam and their combination reduce PGE-2 production and the inflammatory phase of healing directly cause failure in the subsequent fibroblast growth and collagen synthesis. Similar results were reported by who added that the basic mechanism of action of NSAIDs prescribed to deter inflammatory discomfort, possess analgesic, antipyretic, and anti-inflammatory properties at a varying degree depending on the particular drug and the clinical condition. Meloxicam have been shown to inhibit angiogenesis through direct effects on endothelial cells so it may delay wound healing via decreasing prostaglandin synthesis by inhibiting COX-2, which are important in the regulation of angiogenesis who added that the formation of new capillary is a critical component of the healing process that is essential for wound healing since blood flow is necessary for oxygen and nutrients to be delivered to the healing site. In this study, at day 10th postoperative, meloxicam caused a minimal subjective decrease in deposition at the wound site in rats it might be due to inhibit of COX-2 which are necessary for tissue granulation formation and remodeling. While at day 14th postoperative, wound contraction was delayed as recorded by who found that wound contraction is another key feature of wound healing which contributes to minimization of infection and promotion of rapid wound closure. The results of the present study indicated that Meloxicam and their combination used in this animal model of wound healing caused a slight delaying in the healing process. 1. Engelhardt, G., Hommam, D., Schlegel, K., et al. Anti-inflammatory, analgesic, antipyretic and related properties of meloxicam, a new non-steroidal anti-inflammatory agent with favourable gastrointestinal tolerance. (1995) Inflamm Res 44(10): 423-433. 2. Trautmann, A., Toksoy, A., Engelhardt E., et al. Mast cell involvement in normal human skin wound healing: expression of monocyte chemoattractant protein-1 is correlated with recruitment of mast cells which synthesize interleukin- 4 in vivo. (2000) J Pathol 190(1):100-106. 3. Bowler, P.G., Duerden, B.I., Armstrong, D.G. Wound microbiology and associated approaches to wound management. (2001) Clin Microbiol Rev 14(2): 244-269. 4. Erpek, S.,Kilic, N., Kozaci, D. et al. Effects of flunixin meglumine, diclofenac sodium and metamizole sodium on experimental wound healing in rats. (2006) Revue Med Vet 157(4): 185-192. 5. Kingery, W.S., Guo, T., Agashe, G.S. et al. Glucocorticoid inhibition of neuropathic limb edema and cutaneous neurogenic extravasation. (2006) Brain Res 913(2): 140-148. 6. Karst, H., Nair, S., Velzing, E., et al. Glucocorticoids alter calcium conductances and calcium channel subunit expression in basolateral amygdale neurons. (2006) Eur J Neurosci 16(6):1083-1089. 7. Angelis-Stoforidis, P., Vajda, F.J., Christophidis, N. Effects of non-steroidal anti-inflammatory drugs (NSAIDs) on human polymorphonuclear leucocyte function in buffer and plasma. (1998) Clin Exp Rheumatol.16(6): 703-708. 8. Kietzmann, M. Improvement and retardation of wound healing: effects of pharmacological agents in laboratory animal studies. (1999) J Veterinary Dermatology 10(2): 83-88. 9. Jang, H.S., Choi, H.S., Lee, S.H. Evaluation of the anaesthetic effects of medetomidine and ketamine in rats and their reversal with atipamezole. (2009) Vet Anaesth Analg 36(4): 319-327. 10. Bennett, G.J., Xie, Y. A peripheral mononeuropathy in rat that produces disorders of pain sensation like those seen in man. (1988) Pain 33(1): 87-107. 11. Levison, D.A. Theory and practice of histological techniques. 4th edition. (1997) J Pathology 183(2): 243-244. 12. Blomme, E.A., Chinn, K.S., Casler, J.J. et al. Selective cyclooxygenase-2 inhibition does not affect the healing of cutaneous full-thickness incisional wounds in mice. (2003) Br J Dermatol 148(2): 211-223. 13. Nagahiro, I., Andou, A., Aoe, M. et al. Pulmonary function, postoperative pain, and serum cytokine level after lobectomy: a comparison of VATS and conventional procedure. (2001) Ann Thorac Surg 72(2): 362-365. 14. Moore, K., Ruge, F., Harding, K.G. T-lymphocytes and the lack of activated macrophages in wound margin biopsies from chronic leg ulcers. (2008) Br J Dermatol 137(2): 188-194. 15. 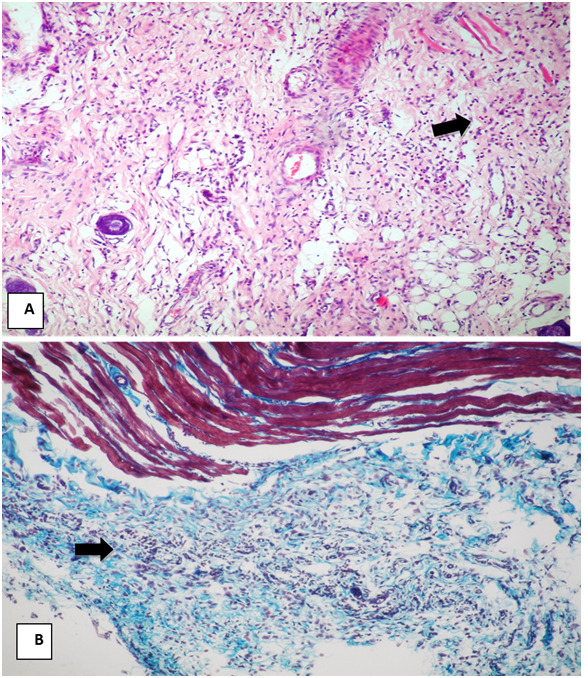 Muscara, M.N., Mcknight, W., Asfaha, S. Wound collagen deposition in rats: effects of an NO-NSAID and a selective COX-2 inhibitor. (2000) Br J Pharmacol 129(4): 681-686. 16. Egozi, E.I., Ferreira, A.M., Burns, A.L., et al. Mast cells modulate the inflammatory but not the proliferative response in healing wounds. (2003) Wound Repair Regen 11(1): 46-54.